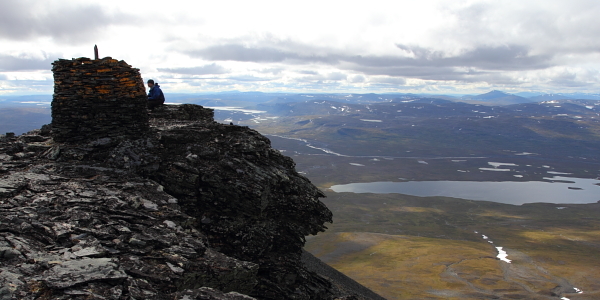 The first part of the “Hiking North” trip series (the Moskkugaisi Traverse) is done and after two days of pizzas, burgers and beer at friend’s place in Kilpisjärvi I’m feeling ready for the next trip (the Poroeno-Reisaelva packrafting). And before the next trip it might be good idea to share some initial thoughts from the first trip. 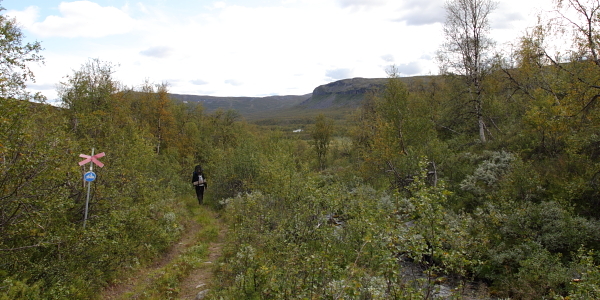 After some five hours of sleep we started the trip from Signaldalen at Thursday morning 09:30 a.m. and finished it to the roadside South of Kilpisjärvi at about 03:15 a.m. on Saturday morning. According to the Social Hiking map based on our Yellowbrick beacons we covered 119km and gained 3274 vertical meters of altitude. For me that feels like quite a bit too much as measured from a paper map the distance should be more like 90km, though the height gain seems right. But on the other hand the beacons seem to be on right places and GPS shouldn’t lie. So who knows, maybe we covered 119km in 41,75 hours? We started from the parking area at the bottom of the valleys and started to walk up the trail to the peak of Bárrás. 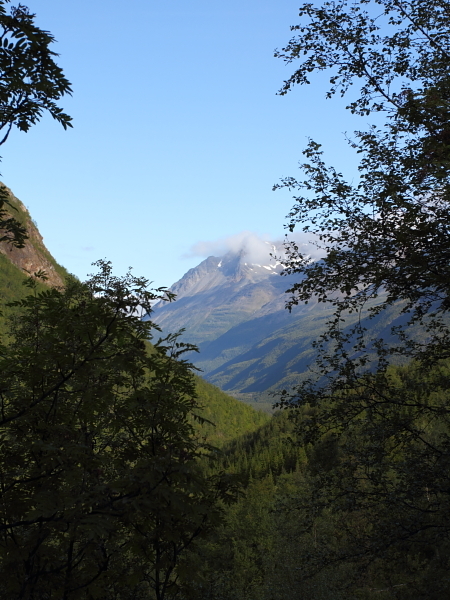 After visiting the peak we ascended back to our backpacks and started the walk towards the rest of the peaks hauling our backpacks up to a pass at 1063m and visiting the Pältsan from there. 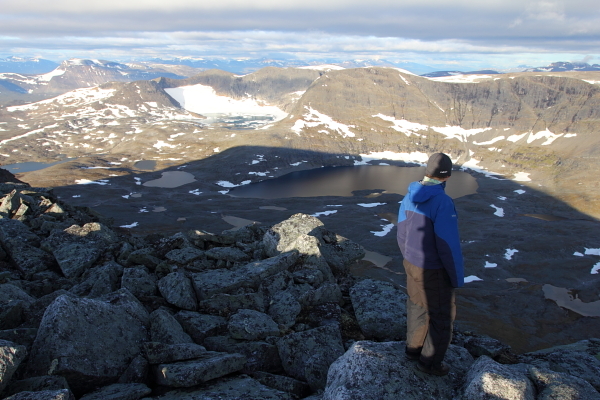 After summiting the Pältsan it was very clear that we had underestimated the time needed for hiking over 3000 vertical meters (of which well over 2000 meters with 15 kg backpacks). 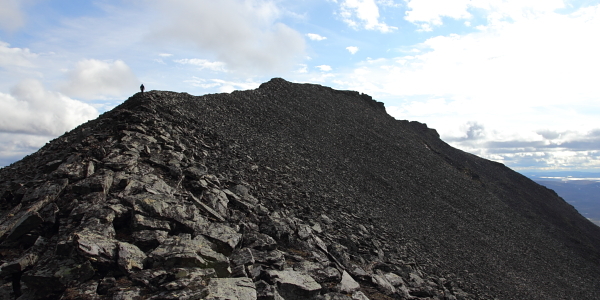 This meant that we couldn’t start the high route traverse of the Moskkugáisi during that day as it wouldn’t be wise to do it in the dark and camp sites are hard to find up on the ridge. 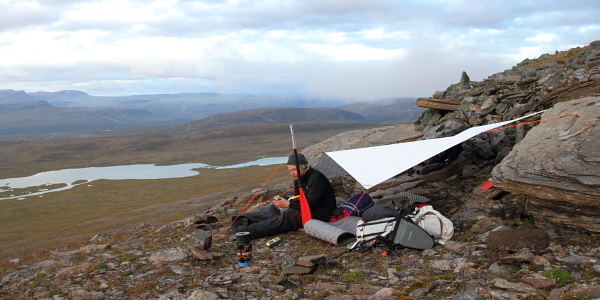 So we camped on the fjell side: two man under a small one-man tarp… I also had a summer weight sleeping bag and as the temps were below zero had a bit cold night. 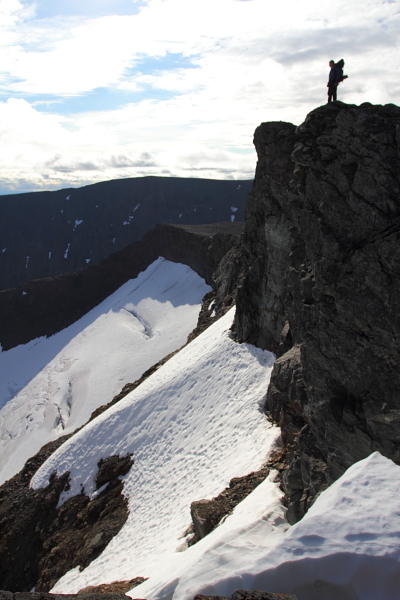 We left the camp at 07:00 a.m. and headed up to the Moskkugáisi followed by a spectacularly scenic high traverse to the ridge leading to Juoksvátnjunni. 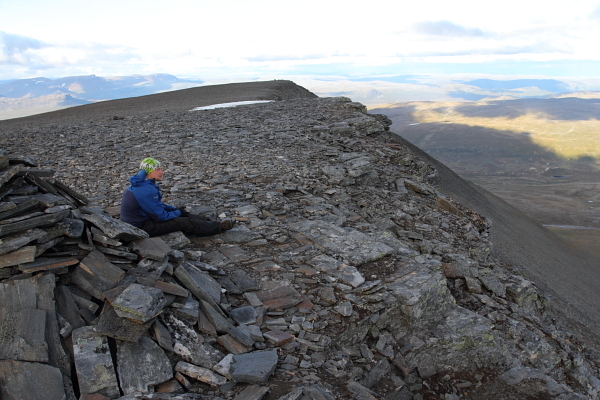 The last peak to visit was the Juoksvátnjunni with cool sharpish rocky ridgeline leading to the summit. After the last summit we walked to the trail leading from Pältsastugan to Kummavuopio, walked a bit along the trail and then inflated our packrafts and started the float down along the Kummaeno river. To our surprise the Kummaeno offered quite poor packrafting. It was fun for a while but soon we got frustrated with the very rocky rapids and several sections too shallow for packrafting. The going was also slow and we were again running out of daylight. And we were also miserably wet and cold. 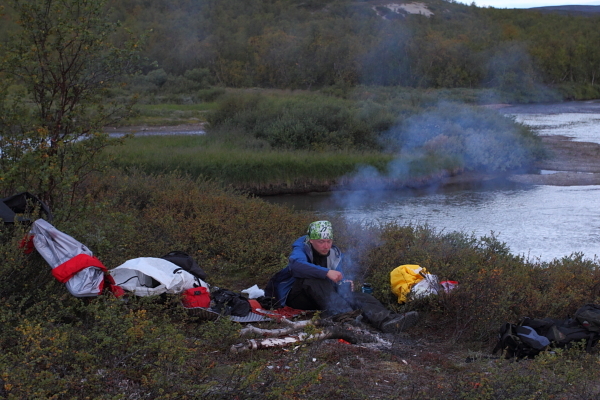 We took out at the edge of Oaggujeaggi bog, made a quick fire using a gas stove as a lighter and had a proper one-hour break with hot food (the first and only proper break excluding the camp). I’m not sure about the packrafting part of the trip, but the mountains are beautiful! It looks like a real adventure. Nice photos and write up. I think toe II fun might be the bet kind of fun there is! Good work guys. Great adventuring. That’s more like it, Jaakko! Some decent mountains and spectacular landscapes. It looks like a great little route to spend more time on – I’m not so keen on racing or rushing it. I guess the discrepancy on the GPS with the distance covered was due to it attempting to compensate for the difference between flat, map kilometers and the additional distance covered when ascending/descending. 19km seems a little generous, but with the twists and winding it all adds up. Was it mostly off-trail? Shame the packrafting wasn’t so great – better luck next time! Thanks for all the comments and likes! 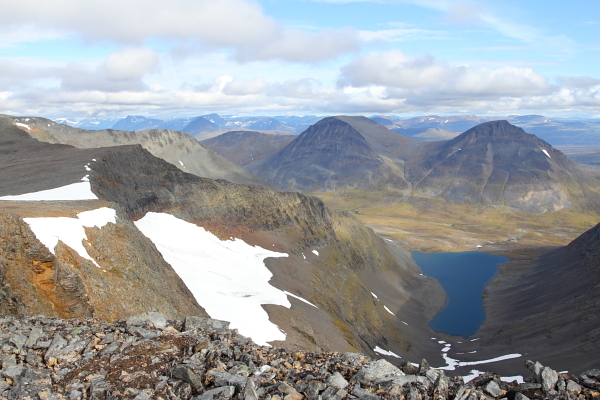 🙂 More on this topic coming after the last trip to Sarek (i.e. after about two weeks or so). 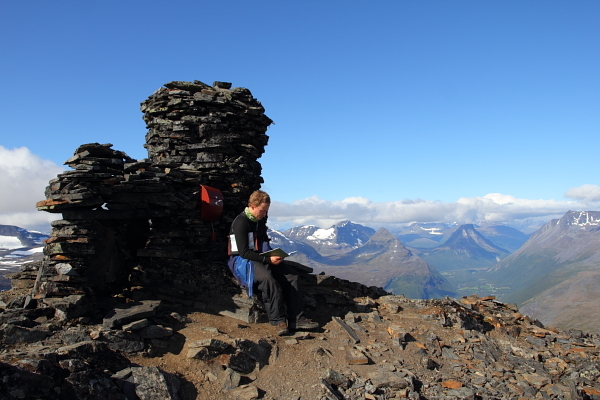 Josh & Mark: It’s a great route, some on the best mountaneous views close to Finland. The packrafting would be probably very good in late June (maybe still in early July) but then there would be also a lot of snow on the peaks. Pure walking trip in early autumn (bugs gone and autumn colors) with 3-5 days would be probably the best way to enjoy the views. Cool to see these places with nice weather! Nice report. I guess the Kummaeno only offers sweet rafting during the melting season, I was also a bit surprised by the water levels in this area. Thanks for dropping by and commenting! I assume you found the water levels also low? I guess it’s not that rainy after all and the rocky ground quickly drains after the spring melt. 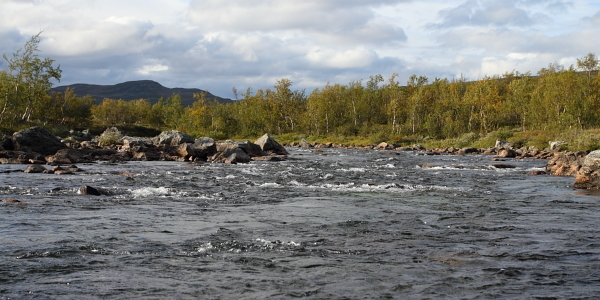 At least Poroeno, Lätäseno and Reisaelva (lower parts) should offer good water level (for packrafting) trough the whole season. Lataseno was fine when I passed there mid-september, I also planned to do the Rommaeno but did not even try in the end, way to many shallow rock gardens! Nice to find reports from other people active in that area.